Offering you a complete choice of products which include precision sheet metal components for electrical industries. We offer an extensive range of Precision Sheet Metal Components for Electrical Industries for various industries such as automobile, lighting and others. These components can also be customized as per the specific requirements of our clients and is available at industry leading prices. 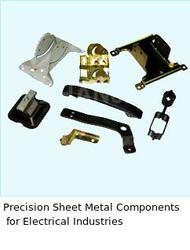 Precision Sheet Metal Components for Electrical Industries are known for their quality. Looking for Precision Sheet Metal Components for Electrical Industries ?